I’m in an eternal quest to reduce waste in the kitchen, especially peels, rinds, all those things that are more common to throw away. As someone who lives in an apartment and it’s not composting, I like to make the most out of what I can while still eating delicious food. When I’m at my parents it’s easier because every kitchen scrap will go to the their chickens and there’s no need to come up with ideas to use everything. I’m not complaining because as a person who likes to be creative in the kitchen, having peels to use up it’s just an excuse to play around in the kitchen. Carrot peels are one of the easiest peels to use so hopefully this post inspires you to get creative with them! I’ll start with the simplest one. I know the all purpose of the post is to share how to use carrot peels but I just wanted to put this out there: you don’t have to peel carrots! I confess, I rarely peel carrots anymore, not even for carrot cake, saves a ton of time in the kitchen. After a good scrub (I just use my hands, no special tools, but if you’ve a vegetable brush use it) they’re good to go. I promise the flavor doesn’t dramatically change, especially once cooked. There’s a small difference when eaten raw but I challenge you to try it out and see if you like it. If you don’t, there’s a bunch of alternatives below! Add them to your vegetable broth, cheap and easy. You can even freeze them along with other scraps like onion skins, green onion ends, etc. Once you’ve enough, let it come to a boil and simmer for about one hour: good homemade broth. Mostly hands off and super addictive. Heat your oven at 200ºC, toss the carrot peels with your favorite seasoning and olive oil (1/2 tablespoon for a cup) and spread them in a baking sheet and bake for about 10 minutes. Avoid overcrowding them to make sure they get crispy. The carrot peels are great addiction to your smoothies. Not only they provide extra nutrients, if you’re not fan of the flavor of the peels a smoothie will mask it very well. Add about ⅓ cup to your favorite smoothie. Carrot goes especially well with pineapple, orange and beets. I just love all stir fries, they’re quick to make and have a bunch of flavor. Adding the carrot peels in your stir fries it’s a great way to make them slightly more interesting. You can also cut them thinly if you don’t want big pieces in your stir fry. I haven’t personally tried this one but found it on The Kitchn and decided to share: carrot peel pesto! What? I am curious! I might even peel some carrots to try this one, will share how it went once I do. 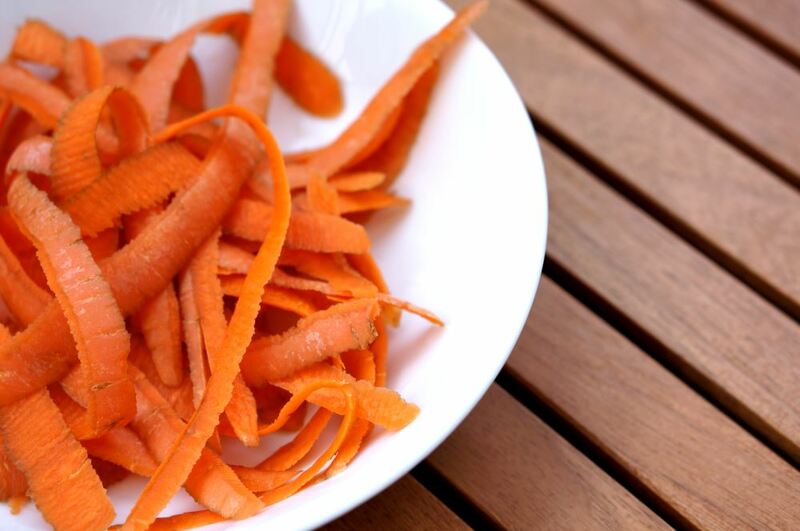 What’s your favorite way to use carrot peels?